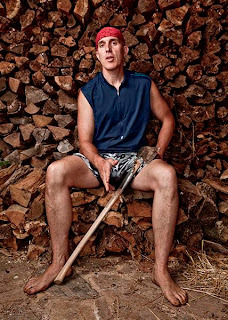 Barefoot Angie Bee: Christopher McDougall interview and a Giveaway!! 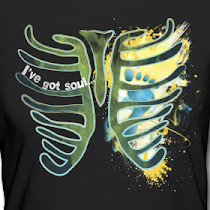 Christopher McDougall interview and a Giveaway!! The folks over at Birthday Shoes have posted an interview with the charming Christopher McDougall, the author of the bestselling book "Born to Run". I found the book to be not only a fun and fast paced story with great characters but also a wealth of information and new ideas based on old practices. Its the kind of book that non runners would enjoy as well as inspiring old and beginning runners alike to look at their sport with a different perspective and to question the status quo. Christopher is a fantastic journalist and one of my favorite articles by McDOugall which is featured in Mens Health magazine titled Everything you know about muscle is wrong. It has broadened my understanding about the interconnectedness of our bodies and it sheds new light on injuries and how to prevent and heal them. Check out Christopher's new blog Here. Here is a chance to win an eBook by a friend of mine, Ultrarunner, Jason Robillard. Win a copy of "The Barefoot Running Guide!" by going to his blog, Barefoot Chronicles, and become a follower. Also go follow him on the Barefoot Running Universities facebook page. Thats all there is to it! Winner will be randomly chosen on 2/13 (Saturday) in the evening, so go sign up now!! As for me... I pounded out 10.5 barefoot miles on the treadmill last night and only have a tiny bit of soreness today. I plan to run again tonight. 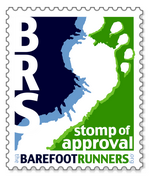 I don't want to feel like I have to cram at the end of the week to keep up the healthy competition some of us barefooters have over at the Runners World Barefoot forum. Barefoot Larry has me beat by 12 miles and Barefoot Dama has quite the lead of 23 miles and Shoeless Shacky is right on my tail!! I love the added motivation! I want to add add add to my current 135.75 miles so far this year. 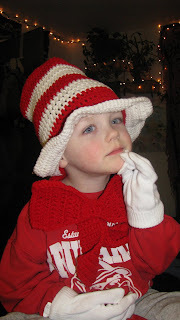 My sister-in-law, who is a very talented crochet artist, sent my almost 4 year old son Milo a Cat in the Hat get up and he wears it constantly! Here is the cuteness that I get to share a house with! Notice the red oversized bowtie!! 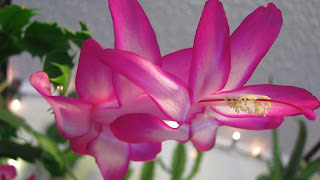 I also have to share the late Christmas cactus, early Easter cactus, whatever it may be. Living with a bunch of flower pickers, the fact that the blooms got this far along is truly amazing! So go check out those articles and blogs and have a great hump day! I am about half way through that bookand am having a hard time putting it down:) Thanks Angie!! Very cool stuff...CM is such an interesting guy. Keep up that mileage and win that challenge! I really have not read anything about barefoot running so I need to investigate this more, thanks for the book review/interview! I LOVE The Cat and the Hat costume, too cute! Kids just love costumes! Thanks Meg! I am blessed to have such cuteness as my house mates! The book is a fantastic read regardless of the barefoot running aspect! I also recommend Ultramarathon Man. if Im not too late I'd love to enter! I have had such a busy week, just getting to everyone's bloggie as best and fast as i can!